From Trackball To The Twenty-First Century! Wait, don't click away! I know a review about a computer mouse might seem boring, this really is a great product at a great price. First I do have to say that I may not be the best person to review a PC mouse, as I have been using a serial track-ball for the past 3 years. Yes, you did read that right. A trackball. I like trackballs because you don't need much desk space to use one, and they put a lot less strain on your wrist. Anyway, the trackball has finally died, the left-click button has stopped working, and I couldn't fix it. Being a bit tight I had a look round Asda's small pc section, and saw this Trust Wireless Optical Mouse for £7, a bargain whether it worked well or not! The Trust MI-4910D comes in two bits, the mouse itself and the little USB wireless transmitter that plugs into a free USB port. Popping two AA batteries into the mouse, and the wireless transmitter into the back of my PC and we were ready to go. 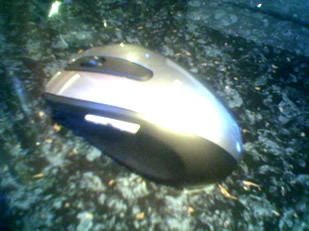 The Trust Optical Mouse is very ergonomic and comfortable to use. It has the usual two buttons plus a clickable scroll-wheel, and also two extra buttons on the left. These add a great feature - these two are for going forward or back on web pages, a really useful feature for anyone who spends a lot of time on the internet. It never skips, is very smooth, and not too heavy either. After using this mouse for a couple of weeks, I have to say that this is the best pointing device I have ever used, the old track ball will be gone for good! So if you're in the market for a new mouse, you couldn't go far wrong with the Trust MI-4910D Wireless Optical Mouse. Recommended. Sounds great, but for those Luddites out here will it work with a green PS2 mouse adaptor thingy? Richard. No, you've got to plug it into a usb port.